Welcome to the website of the Iowa GOP. 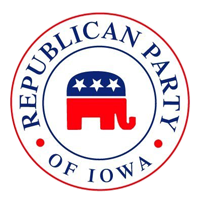 As leaders of the Republican Party of Iowa, we have two simple priorities: Working with the Iowa GOP state central committee, candidates, local Republican parties and grassroots allies to elect all Republicans. We are also working tirelessly to maintain Iowa’s cherished status as the “First in The Nation” caucus state by engaging with Democrats and Republicans in Iowa and nationally. As part of this effort, we guarantee that the Republican Party of Iowa will roll out the welcome mat to every Republican national leader and elected official who wants to visit Iowa to make their case to our grassroots activists. The Republican Party of Iowa is a grassroots-driven vehicle to elect Republicans who have won their primaries. It’s also the role of the state central committee and delegates to translate our party’s goals, core beliefs, and issues into a statewide platform and to expand our Republican base without sacrificing our principles. We firmly believe that we must expand the base of the party. This is a long-term effort that must occur year-round, not just during election seasons. Under our leadership, the party will work to earn every vote in this state by sharing a positive vision of economic opportunity for every Iowan through high quality schools, a business climate that encourages growth through high-paying jobs to support families, and the security Iowans need to live healthy, happy and productive lives. The state party has established a permanent, robust voter contact program focused on volunteer recruitment, absentee ballot targeting and promoting our candidates and policies to Republicans, no party voters and independent-minded Democrats. The party has developed an aggressive, communications operation centered on promoting Republican candidates and principles, educating voters on misguided ideas of Democrats and their candidates, and closely coordinating our efforts with statewide and federal candidates as well as district- and county-level party committees. Ultimately, we are accountable to grassroots Republicans in Iowa—the dedicated volunteers, canvassers, local party leaders and activists who are the foundation of our Grand Old Party. We are both energized daily as we travel around the state working with humble, hardworking folks to elect Republicans this fall. Chairman, Republican Party of Iowa.